I returned to Seattle in the middle of September and immediately signed myself up for a cooking lesson at Book Larder on how to butcher whole fish. What really intrigued me about this particular class was the advertised side vegetable dish and the peach dessert. I have taken at least two other classes from the instructor, Kyle Wisner, and I love that he cooks without exact recipes. Like me, he doesn’t really include measurements so what I have for you are estimates I made from eyeballing the ingredients as he cooked. Don’t worry, I am really accurate with my estimates and have even gone back and measured things after I guesstimate, and I’m happy to say that I am very very close. One of my hidden talents, I guess. Roast the pepitas by placing them in a 350 degree toaster oven for ten minutes. They’re ready when they start smelling fragrant and turn light brown so watch them so they don’t burn. Cool before making the pesto. This can be done a few days before! Place shallot, garlic, salt, zest and lemon juice in the bowl of food processor and pulse to break them up. Add toasted pumpkin seeds, parsley, cilantro and run the machine, drizzling in the olive oil to desired consistency. Add water if you want to thin it out a bit. Taste and add more salt and lemon juice to taste (I added more salt and another juiced lemon). In our class, we tossed this with roasted tomatillos, corn and zucchini! It was the end of summer, after all. I have since coated other oven roasted winter veggies with the pesto–roasted new potatoes, cauliflower, even carrots. 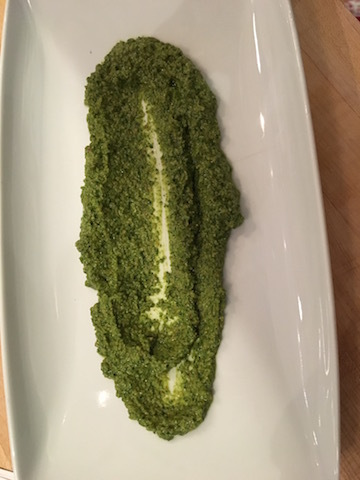 This can be used as a spread if it is pretty thick – or put on veggie sandwiches, as a spread for bruschetta or thinned out with more oil or water to use as a salad dressing or to marinate meat or present as a vegetable dip..
You could switch up the flavors by changing out the herbs – for example if you don’t like cilantro you could substitute something else like that is fresh such as basil or thyme. Swap out the pumpkin seeds for any kind of toasted nut or toasted sunflower seeds. This will last about a week or longer in the refrigerator. 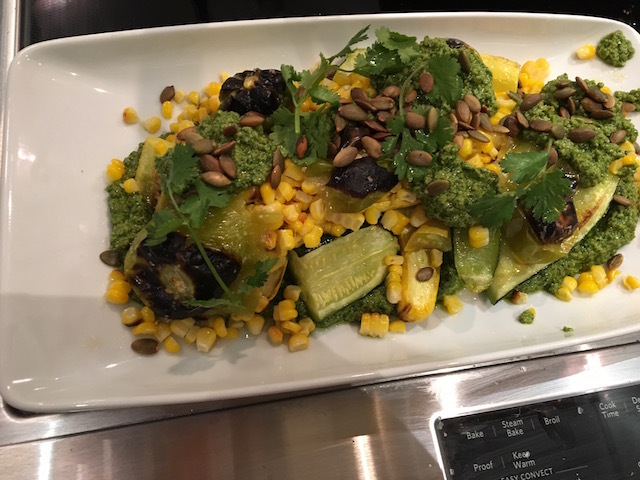 This entry was posted in Condiment and tagged Pepita, pesto, pumpkin seed. Bookmark the permalink.